Cochran served as moderator and presented an introduction to this symposium titled "Client Counseling and Moral Responsibility". It is based on papers and discussion presented at the Professional Responsibility Section panel at the annual meeting of the American Association of Law Schools in Washington, D.C., on January 4, 2003. Members of the panel, Professors Deborah Rhode, Paul Tremblay, and Thomas Shaffer presented three different approaches to moral issues that arise in the client counseling relationship: the directive approach, client-centered counseling and the collaborative model. Under the directive model, a lawyer asserts control of moral issues that arise during legal representation. Client-centered counseling is designed to craft legal solutions which satisfy client interests. Under the collaborative model, the lawyer and client resolve moral issues together through moral discourse. Each provides a different combination of answers to the following questions: 1) Who controls the important decisions in the relationship? and 2) Are the interests of people other than the client taken into consideration in making those decisions? Robert F. Cochran, Deborah L. Rhode, Paul R. Tremblay and Thomas L. Shaffer. 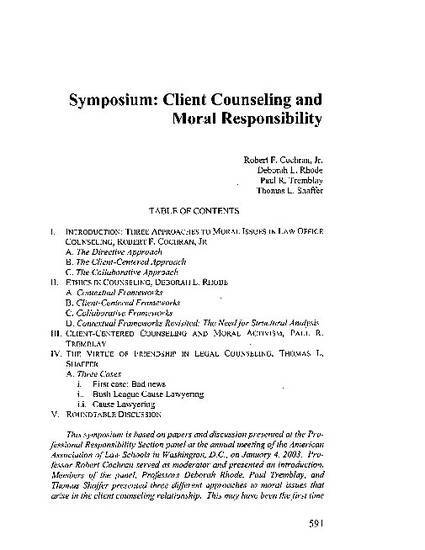 "Symposium: Client Counseling and Moral Responsibility"